The concept of logical separation of a network’s operation into planes first surfaced during discussions in the ITU on ISDN in the 1980s. After initial proposals favored two planes, it was concluded that three planes were necessary, namely the forwarding plane, the control plane, and the management plane. The justification for both control and management planes entailed the following distinction. 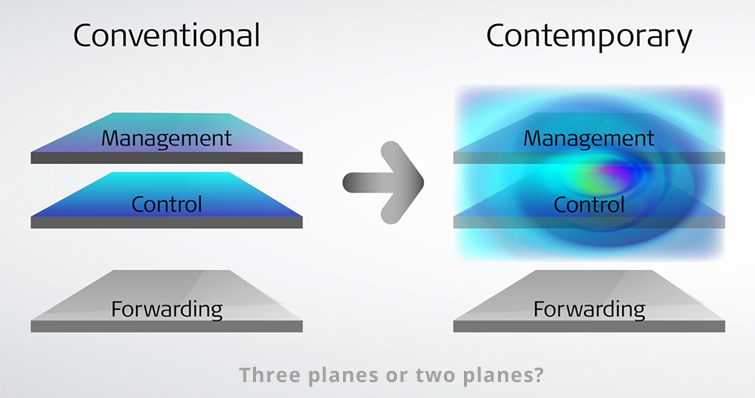 The term control plane was reserved for local (i.e., distributed) interactions between relatively intelligent network elements. The management plane meant the entity that involved human interaction, and since humans were situated in the Network Operations Center, management was a centralized function. Thus, IGP routing, automatic protection switching (APS), loop prevention, and neighbor discovery are all considered control protocols, while alarms (which originally implied real bells ringing), service commissioning, reading or setting network element configuration, and policy dictation are all management operations. Since management involved human reaction times, it is always slower than control plane. So, APS bypasses faulty links within 50 milliseconds (control plane! ), and leaves it to someone in the NOC to notice the defect and send out a technician (management plane!). Over time, more and more of the logic that was once carried out by humans sitting in a NOC was replaced by intelligent software - after all, human operators are expensive to maintain and error-prone, while software becomes more capable with each release. Over time the boundary between automatic control plane operations and manual management plane ones became more and more blurred. Eventually, the only difference that remained between the control and management planes was that the control plane was local, while the management plane fed back to the NOC (now populated by robots). This marked the onset of the orchestrated (i.e., fully automated) networks that are so in vogue today. How does this definition relate to everything we have just discussed? Does SDN truly bring anything new to networking theory, or is it merely a re-hashing of known principles? We’ll find out in the next blog post.